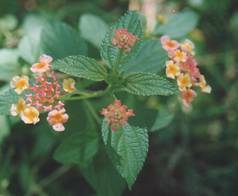 Lantana is one of the worst weeds in Australia. This plant usually grows as a scrambling, dense bush. The stems are usually hairy, and the leaves are serrated and give out a scent when crushed. The flowers are attractive bunches of yellow, pink and red, and are followed by small dark purple berry fruits. The plant can be seen in disturbed area in the Daintree, such as along the Cape Tribulation road. are protected by copyright 1998-2017 John Chambers.